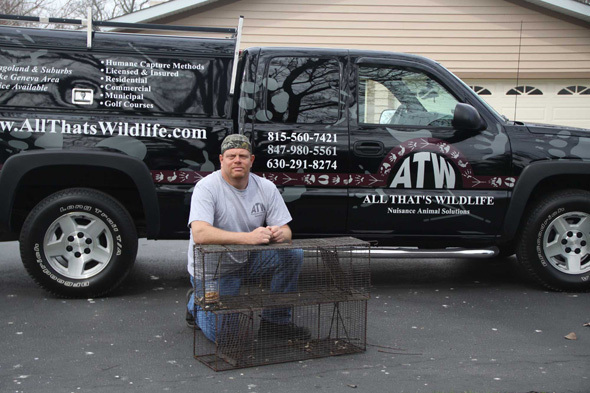 All That’s Wildlife provides professional animal control and wildlife management services for the entire Chicago, northeastern Illinois and southeastern Wisconsin area. We have been in the nuisance animal removal business in Illinois and Wisconsin for over 20 years, and we understand the concern, stress and anxiety that can come with the removal of wildlife such as raccoon, skunks, opossums and other wildlife that have taken up residence in or around your home or business. Our nuisance animal control and wildlife management services include: humane wildlife trapping, animal removal and relocation, nuisance animal exclusions, animal repelling, animal damage repairs, dead animal removal and more. We offer long term solutions for nuisance animal control and wildlife management to homeowners, business owners and property managers seeking wildlife removal and wildlife management services. The professionals at All That’s Wildlife use humane capture methods to remove unwanted animal “guests”, and prevent future reoccurrences of nuisance animals entering again, relieving your stress and getting your home or business back to normal.